Copyright, 1895, by Harcourt & Rein. Words by Charlie Rein. Music by Still Harcourt. Tho' living, but to them as dead. 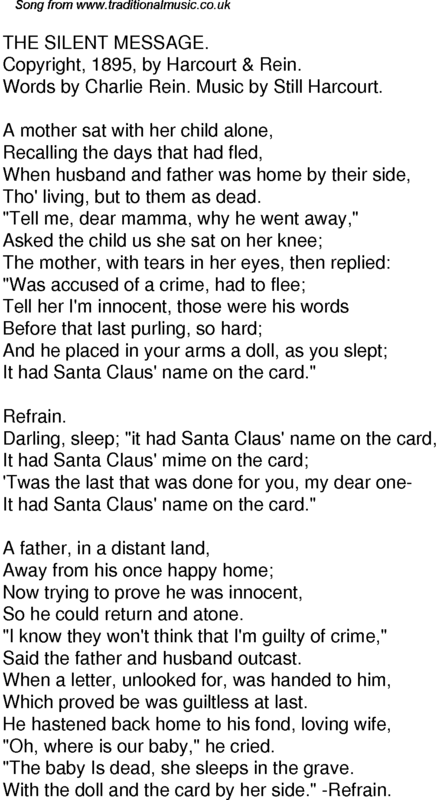 "Tell me, dear mamma, why he went away,"
It had Santa Claus' name on the card." So he could return and atone. "I know they won't think that I'm guilty of crime,"
Said the father and husband outcast. Which proved be was guiltless at last. "Oh, where is our baby," he cried. "The baby Is dead, she sleeps in the grave. With the doll and the card by her side." -Refrain.